This Infinity Command Center 7234 is designed for applications that require simultaneous use of computer monitors for up to 2 people. 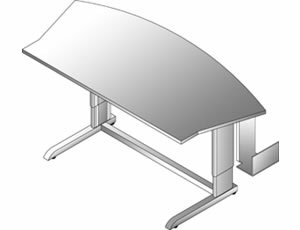 The straight edge at the front is ideal for instructor-student situations or for two people working independently. The work surface is expansive enough for many monitors, computers or other equipment. The push of a button and a very quiet and smooth motor allow users to work at sit-to-stand heights. A sturdy steel frame provides unsurpassed stability even in the highest ranges and has a weight capacity for up to 500 lbs. of equipment.